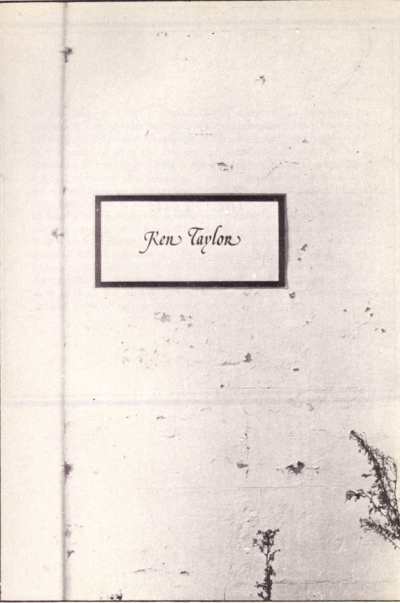 Ken Taylor was one of seventeen poets which appeared in the 1975 ground breaking anthology Applestealers (Outback Press) This is his title page from that anthology. Ken Taylor died last week on 2 April. Ken was the author of At Valentines: Poems 1966-1969, A Secret Australia: Selected and New Poems (1975) and Africa (2000) which went on to win the Kenneth Slessor Prize for Poetry in 2001. Ken’s funeral will be held on Thursday 10 April at 10am at St Luke’s Church South Melbourne, followed by reception at Albert Park Yacht Club. In the following two pieces Rob Pretty remembers Ken and we have republished an interview which John Bartlett conducted with Ken and which first appeared in Meanjin in 2003. This entry was posted in Uncategorized by Mark Roberts. Bookmark the permalink. Kris I’ve made a slight change to the text following your comment.